Hi! 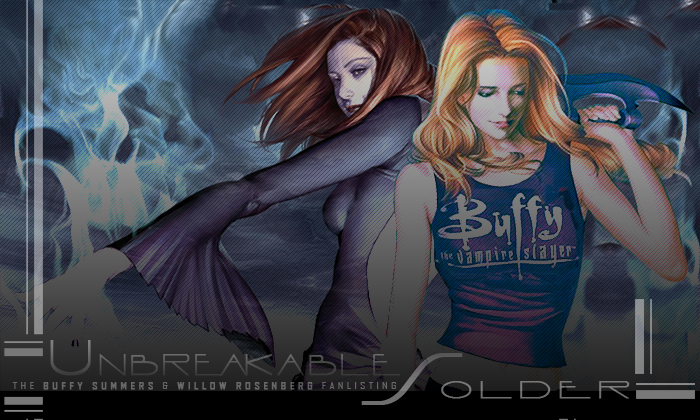 Welcome to Unbreakable Solder, the official TFL approved fanlisting for the sweet relation between Buffy Summers and Willow Rosenberg, the two heroines of the popular TV series Buffy the Vampire Slayer ! The relation between Buffy and Willow is one of the sweetest things of the series. This is the reason why I chose this title as symbol of their fanlisting. Buffy and Willow are not just friends but accomplices, their bond is something that they can feel in heart and soul. The previous owner of this fanlisting is the cute Tonya, that let me adopted it in november 2008, thank you very much!! Please, choose a link from the rigth to fully access this site and if you're Buffy & Willow's fan, feel free to join their fandom! Buffy the Vampire Slayer and related characters are the property of Joss Whedon, Marti Noxon, Mutant Enemy, Kuzui Enterprises, Sandollar Television and 20th Century Fox Television. This is a fan-site, I don't intend violate them. Layout & contents are @Dorothy, do not reproduce without permission.